In October of 1975, Bruce Springsteen became a household word thanks to his simultaneous appearances on the covers of both Time and Newsweek. I remember hearing “Born to Run” a few times back then and thinking that I’d never heard anything that sounded quite so big. Darkness on the Edge of Town came out just before I went off to college in 1978, and one of the songs I played my first morning on the air in December was “Candy’s Room.” But neither one of those made me a fan. At college, I met several fellow students who were Springsteen acolytes, but it wasn’t until The River came out in 1980 that I became a full-fledged devotee myself. It couldn’t have been out very long before I bought it—at the big grocery store near campus that had a couple of racks of records in the pharmacy department, if I’m recalling correctly. I can see me lying on the floor in our college apartment that first afternoon, listening closely while reading the liner notes and lyrics while my roomie wrote a paper at the dining room table. It remains my favorite Springsteen album today: “Hungry Heart,” “Cadillac Ranch,” “Point Blank,” “The River,” “Wreck on the Highway”—they’d all be on my Springsteen top 10. Springsteen was an instant buy after that: Nebraska, Born in the USA, Live: 1975-1985, and Tunnel of Love, before other artists moved ahead of Bruce on the list of artists I would run to buy. In the mp3 era, I have added several other Springsteen albums and tons of bootlegs. He’s #14 on my most-played artist list at LastFM, so I’m listening to him more today than I ever did in the 80s and 90s. I saw him perform a couple of songs at a John Kerry rally in Madison in 2004, but a full concert remains the top item on my bucket list. Forty years after “Born to Run,” instead of sitting in a New Jersey hotel room on a beautiful afternoon doing work I could get paid for, I struck out in search of some of Springsteen’s places. I was pleased to find an AM oldies station for the ride, one playing mostly 50s and 60s—the music that would have inspired him while he was living here. The highway exit right outside the hotel has a sign for Freehold, the town where Springsteen grew up (although fanatics will quickly remind you he was born at a hospital in Long Branch, New Jersey). I did not go to Freehold looking for the Springsteen manse, or the high school where he skipped his graduation ceremony. It was enough to pass through and to have lunch at the Burger King. 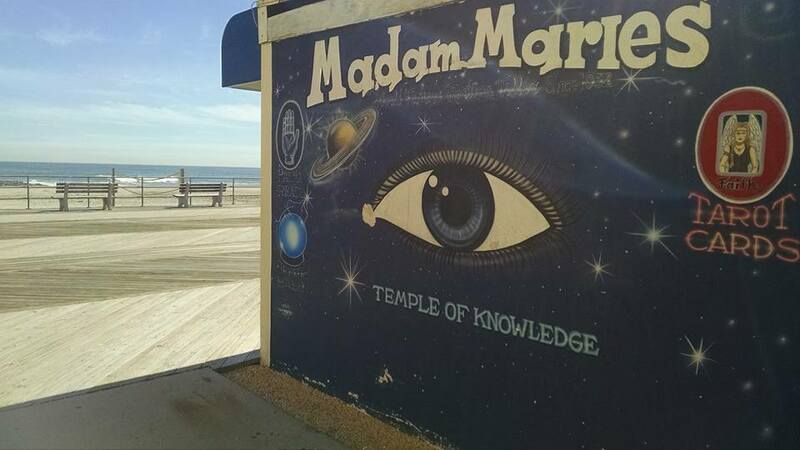 From Freehold, I followed the signs (and the GPS) to Asbury Park, stopping for a while at the boardwalk and the beach, where city crews were cleaning up after the season and the surf was coming in hard. It’s easy to picture the Springsteen of legend there, the guy who painted a beautiful picture of what it’s like on the Fourth of July, and who blew the doors off the Stone Pony across the street. The afternoon waned, and it was time for me to be somewhere. As I left Springsteen’s traces behind, the oldies played on. As they do. A drive through Asbury Park and environs is on my bucket list, but at least you helped me do it vicariously. Would have been cool if you’d seen a ’57 Chevy while “Da Doo Ron Ron” was on the radio . . .